NOTE: THIS POST WAS ORIGINALLY PUBLISHED JULY 11TH 2018. DUE TO SITE HOST TRANSFER DATE IS INCORRECT. This week I bring you my everyday makeup must haves THAT ARE ALL CRUELTY FREE. All of these products featured today are ones that I use on a DAILY basis. Over time I have been wanting to convert into a makeup and with time a skincare routine as well, that are all cruelty free. Today, I am officially sharing with you all cruelty free makeup! What products do they include then you may ask? Keep reading to find out what products I use on a daily basis below. One of the reasons I love this primer: it's silicone free. It's like a moisturizer! I don't like using silicone products against my skin - it doesn't sit well, regardless if it's meant to give my skin a matte, non-oily effect. A little oil never hurt no body! It's made with coconut water, probiotic-based ingredients with skin revivers working to boost the skin's radiance, promote elasticity and obviously hydrate while locking down your makeup for a longer wear. This product is a creamy primer that replenishes moisture levels for the skin, and that can be worn alone for a dewy, healthy looking finish. I have previously featured Eve Pearl's products, and for a good reason, THEY'RE AMAZING PRODUCTS. They are not currently sold in stores, though Eve herself, is hoping to! You can find them through The Shopping Channel or through authorized re-sellers, like, Steph Wong. This is a multi-functional foundation complexion cream. With it's easy one-step application it blends seamlessly into the skin, leaving a velvety smooth natural looking skin. It is lightweight and non-greasy, drying quickly to a matte finish with long-lasting hydration. This too is formulate with CosmeNutrients® complex, a bunch of skin loving ingredients. This foundation also helps to restore & repair with collagen and hyaluronic acid. It helps to nourish and revitalize the skin with astaxanthin, collagen, and peptides. If that's not enough, coconut oil and Vitamin E is also infused to help hydrate and smooth the skin! The best part: it's great for all skin types; and is especially formulated for sensitive, acne prone and mature skin! 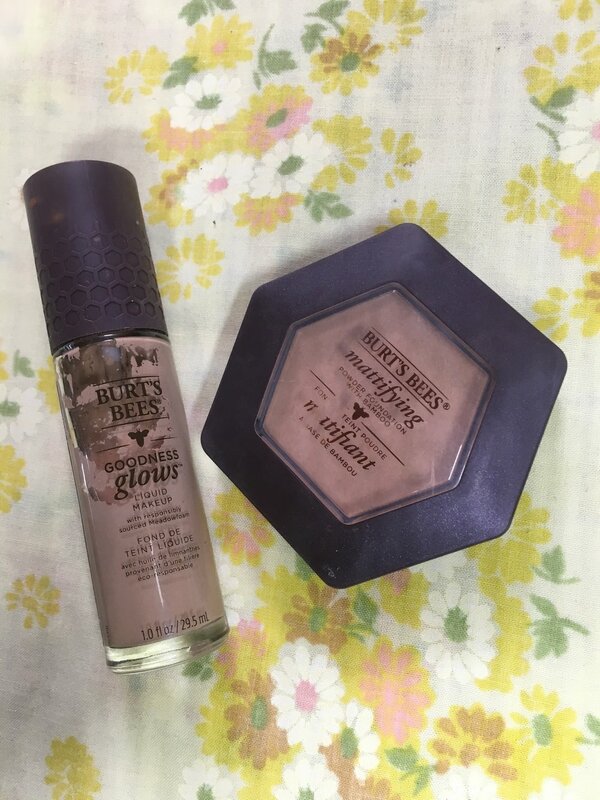 Burt's Bees Goodness Glows Liquid Foundation is a full-coverage, mineral makeup leaving the skin smoother and more radiant with a natural finish that is lightweight and non-greasy. This product is 98.9% natural, instantly hydrating and nourishing the skin. It's made with Meadowfoam Seed Oil, known for moisturizing benefits giving results both inside and out. This comes in 12 shades matching a variety of skin tones, formulated without parabens, phthalates, SLS, petrolatum or snythetic fragrances; is dermatologist tested; and is NEVER tested on animals. This 100% natural mattifying powder foundation in bamboo controls shine with a buildable and blendable coverage to give a smooth and even skin tone. It is both lightweight and non-comodogenic, perfect for oily or combination skin, as it effectively absorbs the oil without drying out your skin. This product is formulated without parabens, phthalates, SLS, petrolatum or snythetic fragrances; is dermatologist tested; and is NEVER tested on animals. Amazonian Clay 12-hour Blush in "Paaarty"
I love miniature makeup and anything travel friendly! This blush, I believe was part of the Sephora birthday gifts. Since this product is made with Amazonian Clay, it is long-wearing therefore the pigment looks freshly applied all day. The pigments are super soft and silky which allows you to layer up with no harsh lines or chalky build-up. The Amazonian Clay helps to control oil and infuse moisture for balanced skin and provide seamless blending. 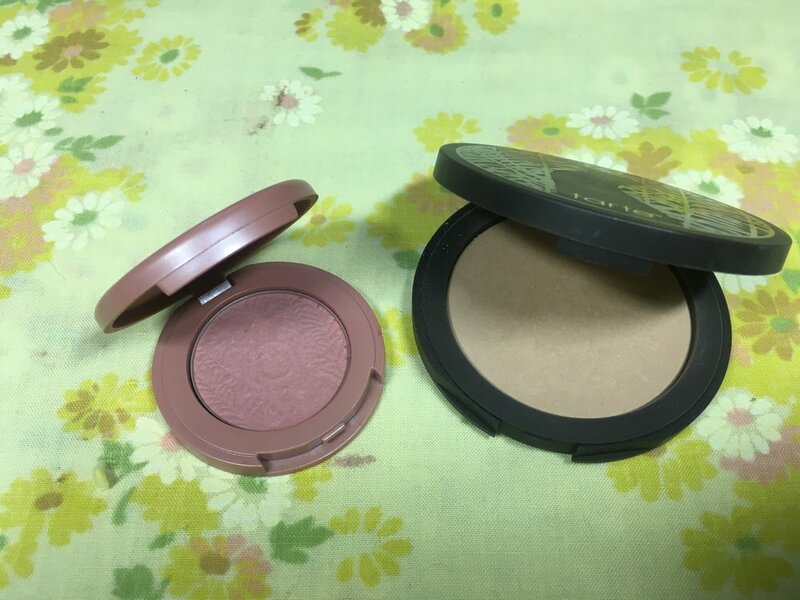 In case you don't know, I am a huge fan of pressed powders. It's travel friendly, and easier to bring everywhere without having to worry about fallout getting all over the counter! As previously mentioned, this product is also made with Amazonian Clay, so the pigment is long-wearing, super soft and silky, controls oil and infused moisture balances your skin so there are no harsh lines! Bonus: this powder contains invigorating skin ingredients! It's made with vitamins A and E, antioxidants that fight free radical damage, and mineral pigments known for soothing and softening the skin. This is also travel friendly in case you didn't pick up on that. Highlighter, Blush and Contour palette in one. And it's super small so it's even better! 70% of the time I am wearing this trio! This bronzing trio is ideal for every skin tone, for EVERY SEASON. Use Gold/Pink Sand/Champagne together to achieve a natural glow. 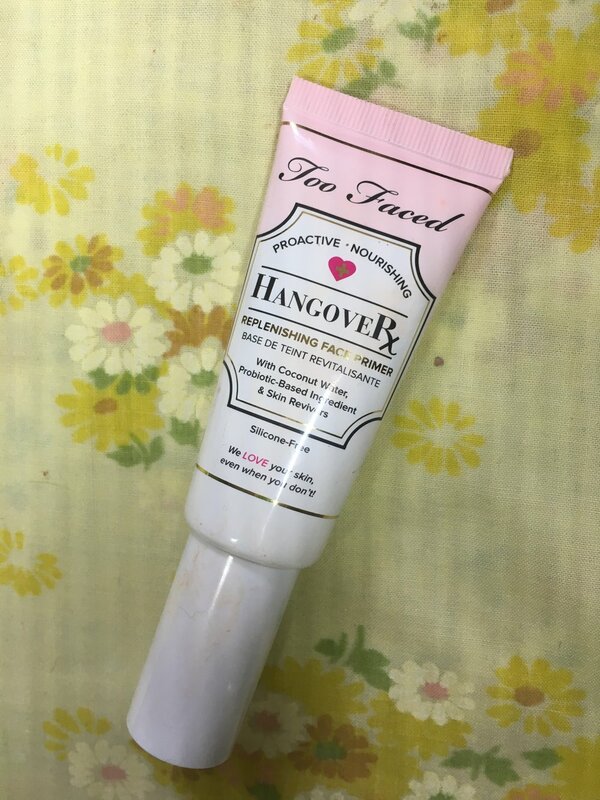 You can use this on the bare skin or over foundation if you'd like. It will create a subtle, sheer finish however you use it. The blushes are double pressed to contain Vitamin E and skin conditioning agents, giving you all the benefits of pigments and antioxidants! Like all the other products I have featured so far today, this too, applies evenly without any harsh lines, are buildable, and gives a natural look! This setting spray is one of my favourites so far! It gives a glowing, luminous and smooth complexion while hydrating, protecting and nourishing my skin. It not only sets the makeup, but adds a dewy finish to protect the skin. 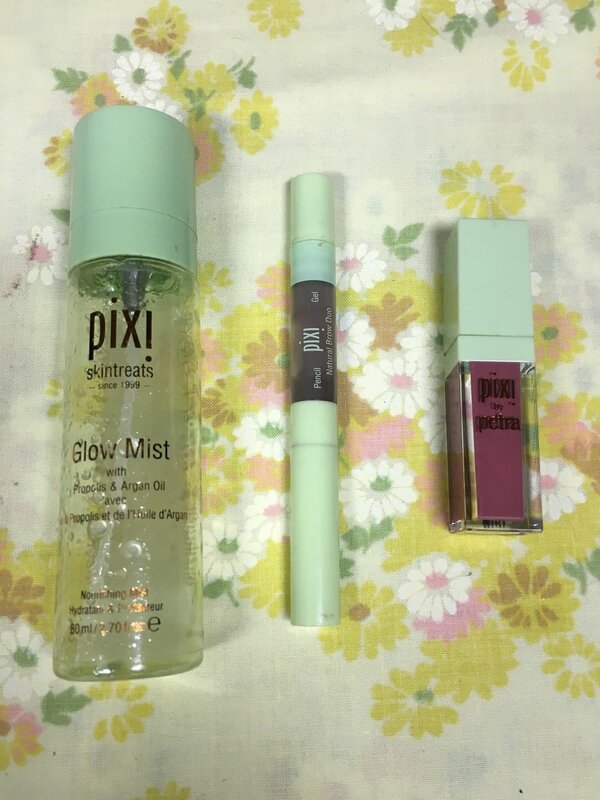 It's a great refresher for your makeup and gives you the "glow". You can even use this on your hair if you'd like! This product is enriched with 13 natural oils plus propolis, aloe vera and fruit extracts. Suits all skin types, and of course, it's not tested on animals! Natural Brow Duo in "Deep Brunette"
Brows are essential to framing your eyes, face and completing your entire makeup look. This dual ended product comes in four shades. One end holds a waterproof brow pencil with an angled tip to help achieve the natural-looking application. The other end, contains a tinted soft-hold gel that helps to lock the brows in place. It's super simple. It's fragrance free and dermatologically approved. I've gone through a handful of this product already this year! Matte Last Liquid Lip in "Really Rose"
This is easily one of my go-to lippies! This shade against my skintone is the perfect natural lip colour with a touch of pink. It is extremely longwearing and comfortable. It dries matte but does not dry out the skin; it actually hydrates it! I first bought this back in February thinking it wouldn't be that great and it definitely exceeded what I thought. It not only stayed through my lunch date with my friends, but it lasted HOURS. The colours are universally flattering and wearable! (I got my friends to try this too). The applicator is a unique PixiPetal that provides even and precise application. The best part: it's paraben free, and of course, not tested on animals. It smells phenomenal too! Did I mention it's not drying? AND IT'S A MATTE LIPSTICK? That's all folks! My everyday makeup routine that consists of brands that are cruelty free. No popular products like MAC, Smashbox, or Makeup Forever are in here because personally, I know there's better out there that suits my skin. And I found them for you finally. What other brands are cruelty free that you haven't tried before? Are there any products, even the ones I mentioned that you want to try? Let's chat! I wanna know what cruelty free products you enjoy using! Stay tuned for next week's blog post! In the mean time, find me on Instagram, Facebook and Twitter!